A true manufacturing advancement, our brand-new robotic work cell reduces costs by streamlining the inspection and packaging process. This leading-edge system incorporates inspection and packaging of high-volume parts. The three-step process allows parts to be inspected and packed without human interface. First, a camera system detects defects and separates them. 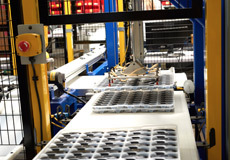 Then, parts are robotically picked and placed into the appropriate cell packing tray. Finally, a packaging and handling machine processes the number of empty and full trays of packaging needed for a complete box. The result: increased efficiency and tighter quality control that makes for a better experience – and product – for our clients.